Trident (Trisulam): A three-pronged trident shown adjacent to the Lord symbolizes His three fundamental powers (shakti) of will (iccha), action (kriya) and knowledge (jnana). The trident also symbolizes the Lord's power to destroy evil and ignorance. At dawn I contemplate on Shiva, the God of gods, the remover of the fear of transmigration, who holds the Gangã in his locks, and rides a bull, the Lord of Ambicã (the Divine Mother), the wielder of the club and spear (in two of his hands) and with the other two offering boon and protection and who is the one infalliblê remedy for the afflictions of relative existence (Samsãra). Worship Vishwanatha, the wielder of the trident, the Lord of Varanasi and of the demigods, adorned by a snake; who wears a tiger skin and has matted locks, the Three-eyed One, who has the noose and the goad in two of His hands and who with the other two offers boon and protection. One of three great gods in India, the others being Vishnu and Devi. Shiva's attributes in North India are the trident and snake; in the South, an antelope and axe. His mount is the bull, Nandi. Shiva is a god of the wild mountains and forests. 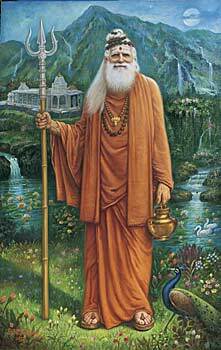 He is the god of outsiders, yogis, wandering ascetics, and hermits, who do not fit into organized society. His wife is Parvati, with whom he lives in the Himalayas. Many elements of Shiva derive from indigenous, pre-Aryan, cult. The terms Siva or Sankara mean Auspicious. Thanks Koravya. Nice links too.